"I don't want to stop working," she says with youthful determination. Mrs Popat cannot believe that what started as a desperate move to "supplement the family income" 50 years ago has come so far. She says after taking a deep breath: "I feel I am living in a dream world. When we started our business it was not meant to become so big." It is indeed a big business today, with an annual turnover of nearly $100m and a flourishing exports account to boot. The Lijjat trade began when seven Gujarati housewives decided to exploit the only skill they knew - cooking. Mrs Popat says: "We were semi-literate which restricted our chances to get jobs. But we realised our papad-making expertise could be used to earn small amounts of money to help our husbands reduce their financial responsibility." The "seven sisters", as they are fondly remembered, started production with the princely sum of 80 rupees (now $1.50), borrowed from a good Samaritan, Chaganlal Karamsi Parekh, a social worker with entrepreneurial brains. Mrs Popat pays handsome tribute to Mr Parekh's contribution to their success story. "He advised us that if we wanted to experience success, never accept donations. We have never ignored his advice." Soon the entrepreneurship expanded in Mumbai's overcrowded and poverty-stricken shanty towns. Foreign dignitaries visited their factories. The women received one award after another. Exports flourished. 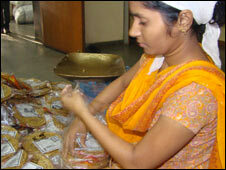 They were on a roll - from poppadoms they branched out into soaps, savouries, chutneys and pickles. 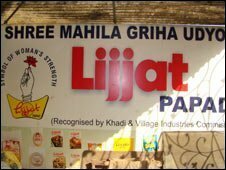 But apart from following the advice of Mr Parekh, what is the secret of Lijjat's success? After all there are other poppadom makers all across the country. 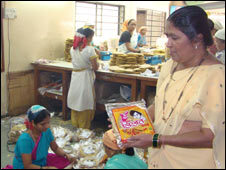 Mumbai-based businessman and entrepreneur Sushil Jwarijka explains: "Lijjat papads are a perfect example of how a sustainable business can be built, providing large-scale employment to rural women, who are illiterate but skilled. "And when such skills are given an organisational structure on a co-operative basis a long term sustainable model assures success." 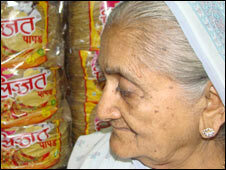 Jyoti Naik, who runs Lijjat's head office in a Mumbai suburb, joined the co-operative 40 years ago. She says it is the women's sense of financial independence that has made a small enterprise into a big business. "These women work here to help raise their children and be financially independent," Ms Naik says. "Today I can say I am financially independent. If my husband doesn't give me any money I can support myself and children. I don't need to beg and borrow." She has no regrets: "All my life I have worked here. I know no other skills. But papad-making has made me independent. I pay tuition fees for my three children and my husband runs the kitchen."